Well, today was my first day of training for my new job withing the company. Myself and another guy who has moved from the same department as myself both agree, its like a big weight has been lifted off our shoulders. A weight I have been trying to shift for over 4 years now. A lot of what we covered, actually the majority of what we covered I already knew seeing as I have been at that company for nearly 10 years now but still was good to go through it with new people. D said that this morning when I left for work, I looked more relaxed and wasn’t the normal ‘oh my god, do I really have to go in?’ type of attitude that I have before setting off to work. Mind you, I found it hard to get up when it was still dark to be at work for 8.45am. My o/h, shocked me today by saying she wanted to start her own blog. She’s never shown any interest in the past. After being at work for 1 day today, I’m off tomorrow then in training for 2 weeks for my new job as mentioned on the previous post. Today, at work has been so boring. I just wanted the day to end. Its probably because I was so looking forward to the day being over. I had to empty my drawers. Its surprising how much rubbish you gather when using the same set of drawers for about 7 years. My car boot has 3 full bags to be sorted. Well tomorrow, weather permitting, we are going to Newcastle quayside to mooch around the market there. I love doing this. Looking for bargains. We normally end up at a nice little coffee shop at the end of the market and have a couple of cup , or in my case large mugs of filter coffee. We sit outside, not just you can smoke but also, I love just people watching and taking a few photos. People are great to watch. The clothes, the mannerisms, expressions, the whole package. See some funny people out and about. I’m sure I will have some photos to post. Ideas for my blog. Where are they? I have been sitting thinking about what to write in this blog so that I can get more followers and make it interesting for people to read. I have scanned Google for ideas but still cant get the old grey matter working. What subject to blog about, what to say, how to word it. Its all very frustrating. I want to write about my daily life and what goes on, and my thoughts and views on things. Some people seem to have very successful blogs and a good following. Whats their secret? How did they get people interested in their blog? I wish I knew. I’m not looking to have the most successful blog ever, just one that has a following and is interesting and one I’m happy with. If anyone has any ideas or can point me in the right direction of a good site to instruct me, please let me know. After months of waiting, myself, Paul and Rob went to Donington Park to watch the BTCC. Great, I hear you say. Well, yes, apart from 2 days before I put my back out yet again. This time, all I did was turn round and felt it go. It goes as easy as that. Once I did it just brushing my teeth. Anyway, I was still able to walk, although slowly, so I decided to still go. After all it was Donington Park, where I had wanted to go for the last few years. Paul turned up at about 05.15. We packed the car, just. Wasn’t much space left. Then set off on our journey. After doing that we decided to go to the track for free practice and qualifying. I had only got a few yards from the tent when my back gave way again, forcing me to drop my camera bag and chair. Rob went back to the tent and got my hiking stick and Paul carried my stuff. It took ages for us to walk the short distance to the track itself. I kept having to stop because of the pain. We walked, slowly round the paddock area and checked put the infield, then headed for Redgate corner where they sat me down to be more comfortable. Paul and Rob went off to take photos down the Craner curves. At lunch time we went back to the tent for food. I decided to stay back as I didn’t think I could cope with the pain much more. After having a good night sleep on my airbed I was awake at 06.00 and decided to stay up. Later on after Paul and Rob woke up, we all had breakfast and I decided I would stay back at the tent again. Paul and Rob would of rather I went to the track but understood when I explained how I felt. At one point I stepped in a divot and had to grab Paul to stop myself falling back. Hope I didn’t bruise his arm. It was a long day by myself. At the end of the day they came back and packed everything away and started the journey home. We, again stopped off at Woodall services for a McDonalds this time. When we got home, I was so pleased. I have to say that Paul and Rob were brilliant. They were so understanding about my pain. I felt like I spooky the weekend for them but they say I didn’t. I am so thankful to them. It’s certainly one trip away I won’t forget. On the left edge of the image is a chip shop with a great little cafe. Its not your normal ‘trendy’ cafe. 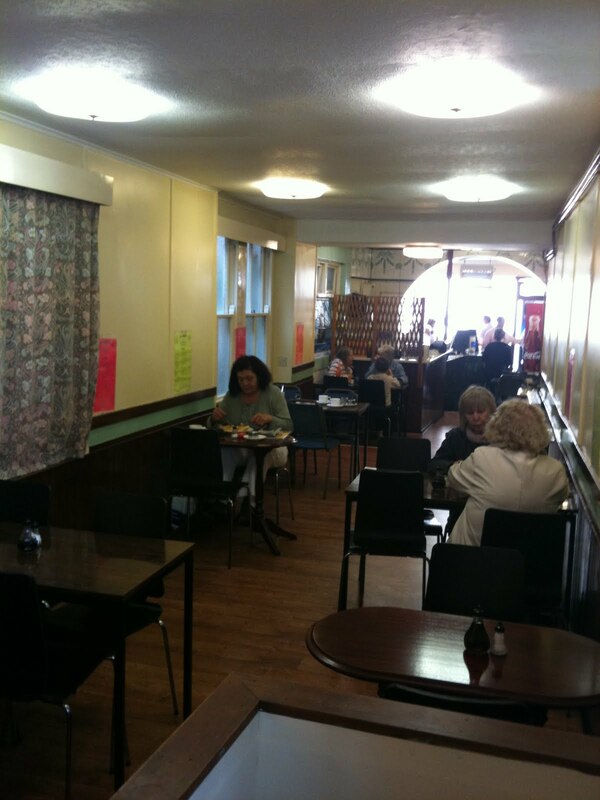 Its like a 70s / 80s style cafe with dayglo card signs on the walls etc. I loved it there.